C-Line's exclusive Do-It-Yourself Laminating Film lets you seal and protect your valuable or frequently handled documents with ease. Just peel off the split back liner and apply, it's truly that easy! No heat or special equipment is needed. The clear finish offers a sharp, transparent finish. It is perfect for showcasing your materials and makes presentations appear bold and bright. C-Line offers heavy-duty and durable laminating sheets that will not crack or tear with age. You'll literally find hundreds of uses at the office, home or school. From phone lists, photos, maps and projects, to decorative pieces, Cleer Adheer is the choice for quick and easy laminating protection. Multiple sizes and formats meet your individual project's needs. Great for news clippings, pictures, catalog sheets, etc. Insert Size: 9 x 12"
Transcript: These are the C-Line Heavyweight Cleer Adheer Do-it-yourself Laminating Sheets! To start, you’ll notice that on the side is a line—you can’t see it in the video, but if you flip it to the other side, you can peel off a small strip from the release liner. Now take your project and line it up. Partially stick it to this revealed section. From there, begin to peel away the rest of the liner, revealing the adhesive and sticking the project onto the laminating sheet. Pull it out all the way. 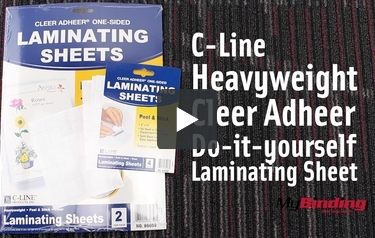 These are the C-Line Heavyweight Cleer Adheer Do-it-yourself Laminating Sheets! Now, this can be tricky. If you’re not careful you could end up with creases, like seen here. It’s permanent, so you can’t fix them. You can leave it as a single sided lamination, or continue a similar process with another laminating sheet on the other side. Line it up nicely, peel off the release liner, and now it’s double sided! All you have to do is trim up the ends. You’ll see that you may end up with a somewhat splotchy finish—this is mostly noticeable from up close. You can also precut your sheets to be as least wasteful as possible. If you want an easier process, and higher quality results—look into a pouch laminator.